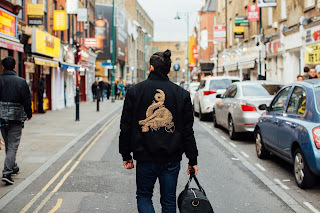 "36 Chambers is a contemporary menswear brand that pulls inspiration from hip-hop, Chinese culture and high fashion. Built upon the foundation of Wu philosophy, we’re creating a line hip hop fans have been waiting for." "OK, OK, OK" in my best Leo Getz impression, it's hotter than a Saharan cheetah's ball bags but this is a chance to get a jacket bought early for colder weather at the end of the year. Having debuted this past winter, 36 Chambers is having a warehouse moving sale until July 1st. There's 50% off the Denim Flight Jacket, Quilted Motorcycle Jackets and my favourite The Wool Varsity Jacket. If like me you were interested in the collection originally but hesitant due to the prices, particularly the outerwear mentioned which feature immaculate details and construction then grab a piece now. Sizes are already selling out on everything so don't be like Mr Miyagi, be quick like Daniel catching a fly with chopsticks to not miss out.